Unlimited downloads and no waiting time instant downloads. Buy Rapidgator.net 180 Days Premium Account with a Cheap price of Just $38 for 6 Months Premium. Best Premium Reseller !!! Step 1 : Send a “Request an Invoice and the payment method you wish to pay” After receiving your Request, We will send you an Invoice email. Step 2 : Open your mail and check for Invoice. Pay that Invoice then reply that mail to inform us. Things to Remember : We will send the account details within 2 – 24 hours, after we receive your payment. Things to Remember 2 : The account you are going to purchase comes with Full warranty and support , Our support is available 24*7. Additional Note :We are trusted ebay seller team with 10000+ Positive Feedback , Buy with confidence. Money Back : We will provide you 90 Days Money Back Guarantee, If you are not satisfied with our service. Buyer Protection : Your purchase is protected , We guarantee safety of every transaction and we fully honor your purchase. 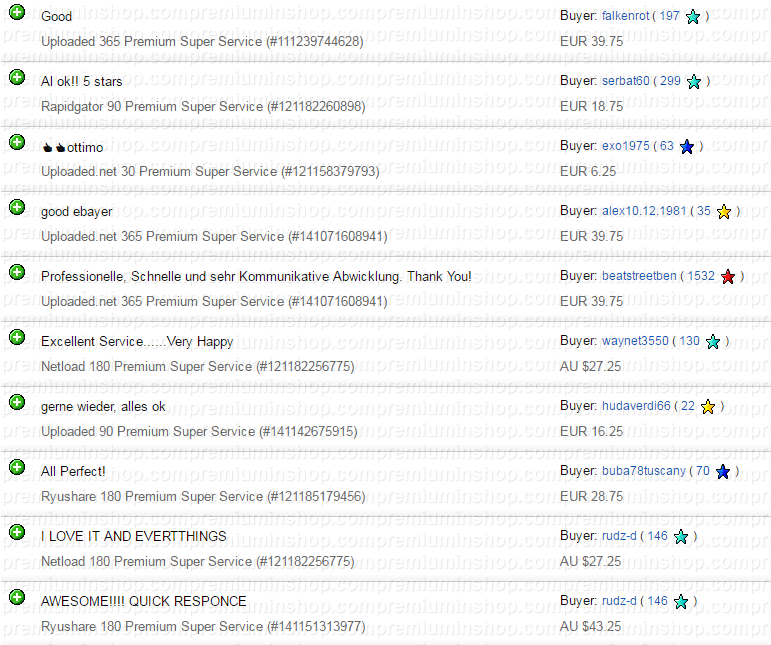 We are trusted ebay sellers with more than 10000+ positive Feedback only for selling File Hosting Accounts.